Watermark can be added to any number of PDF files. Watermark can be added either as text or image. Provides an option to customize text. Image can also be customized. Supports multiple formats of image: jpg, jpeg, gif etc. Installation of adobe acrobat reader is required. As the PDF documents many times used as confidential documents, so Watermark helps to gain authenticity of the document and keep it secure. And the PDF file can be made copyright protected by applying a Watermark to it. 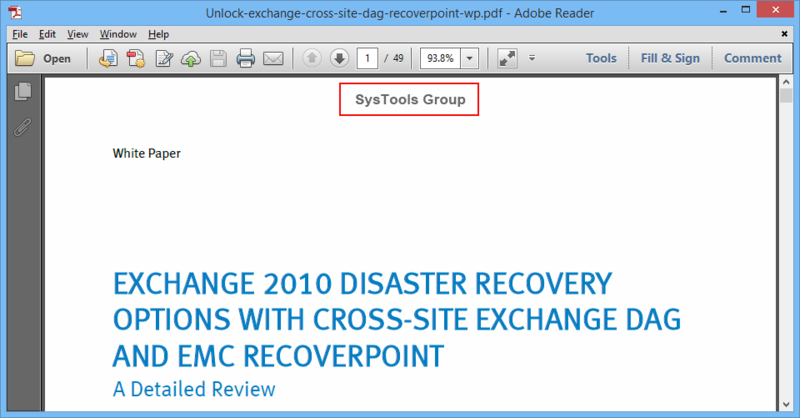 As Text: It enables stamping of text on the PDF file(s). 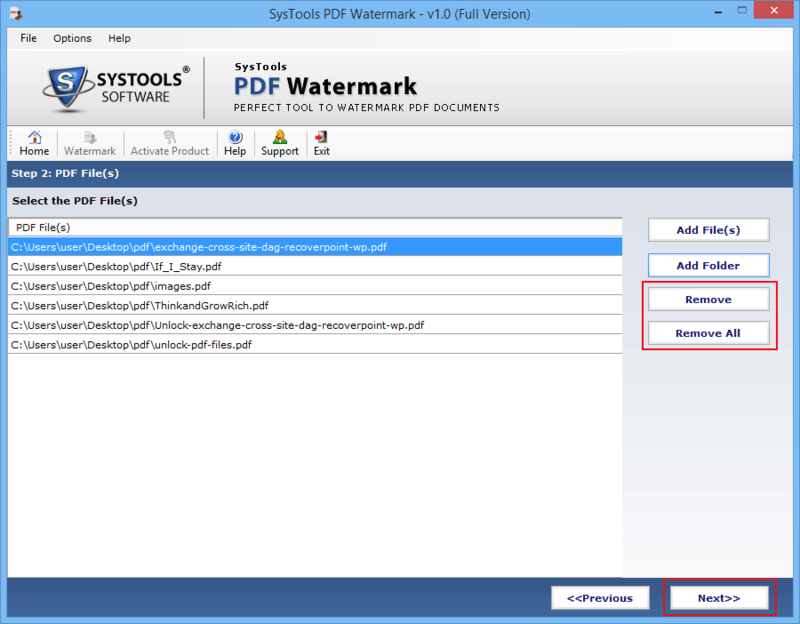 As Image: It enables stamping of image on the PDF file(s). 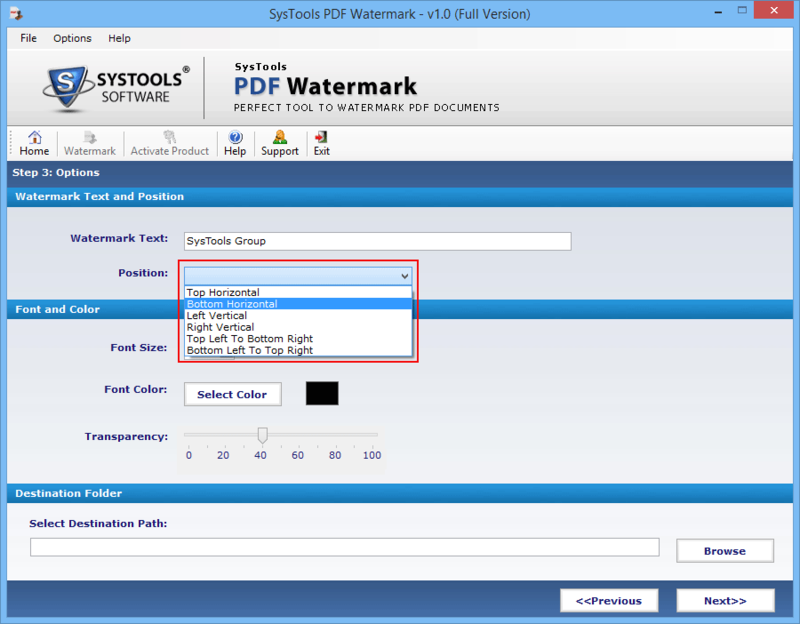 This Insert Watermark to PDF tool provides both of the above mentioned options. The text added as a Watermark can be modified in the following in the following different ways such as position of the text can be set, color of the text can be changed and size of the text can also be changed according to the requirement. 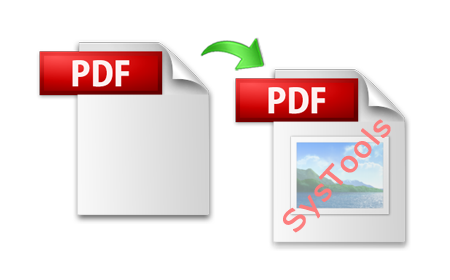 The Image added to PDF files can be customized in different ways by setting position of image like To left, Top right, Top Middle, Middle right, Middle left, Bottom right etc. After this, check scan image feature to place it at appropriate location. The image of different formats that can be added as Watermark. It does not restrict to any one format. 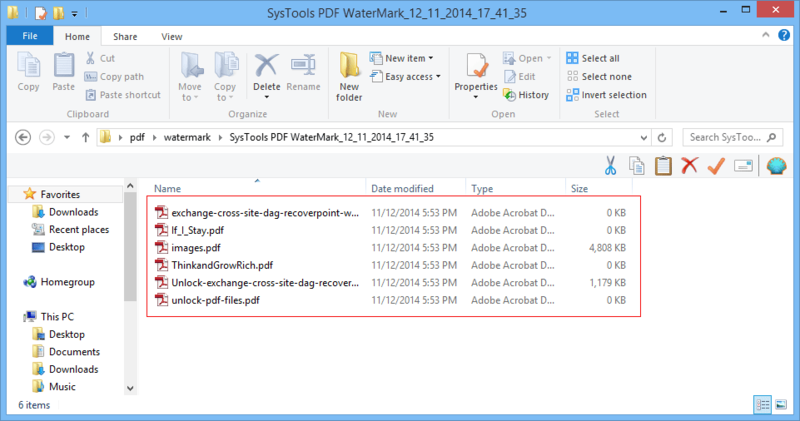 Add watermark on Adobe PDF tool can support formats: jpg, jpeg, gif, png etc. so user need not to worry while adding the image Watermark. Any image can be added. As PDF files are opened in the adobe reader. So installation of it is required to apply Watermark. There is no restriction on the version of adobe reader installed. 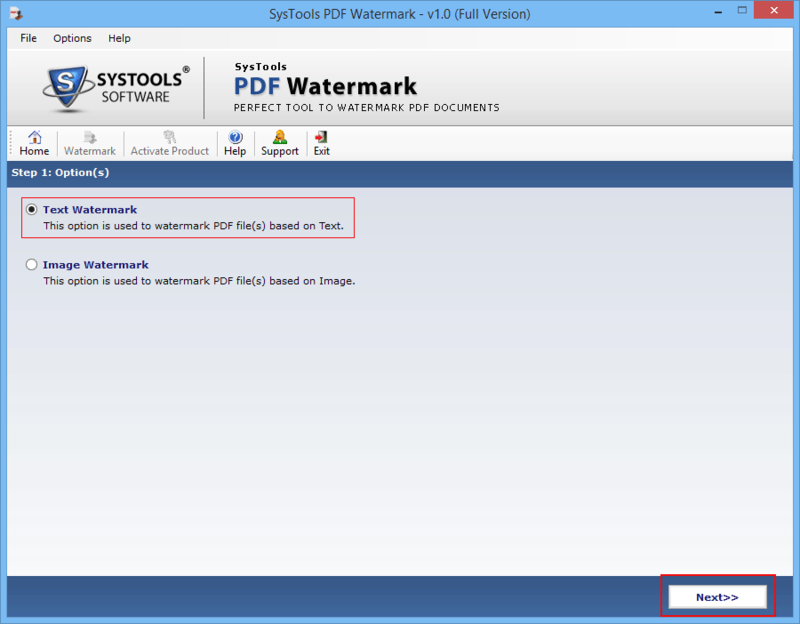 Create watermark on PDF tool supports all the version including adobe acrobat reader 11.0 and below. 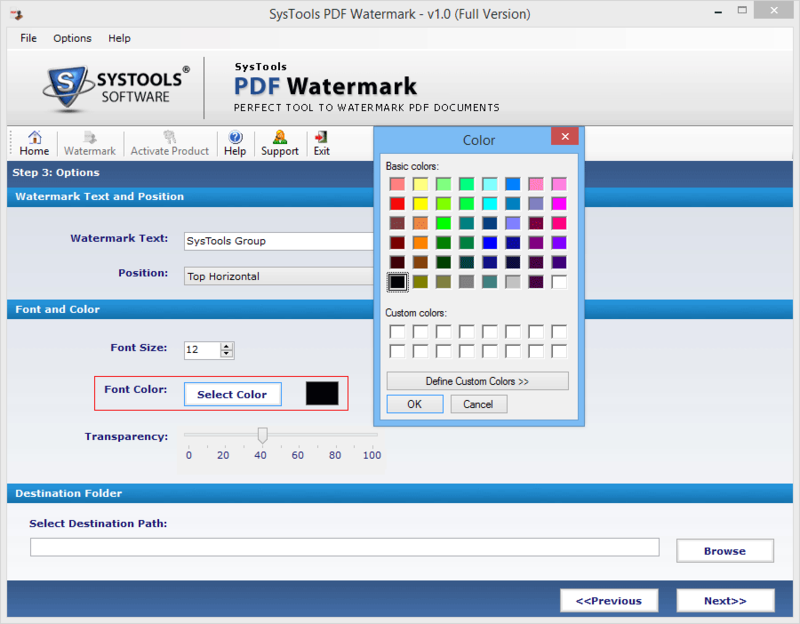 This report displays the brief summary of user selections, which includes: selected number of PDF documents, color transparency, Watermark position, size ,color & font of the text or image. It will help user one more time to verify the details before applying Watermark. 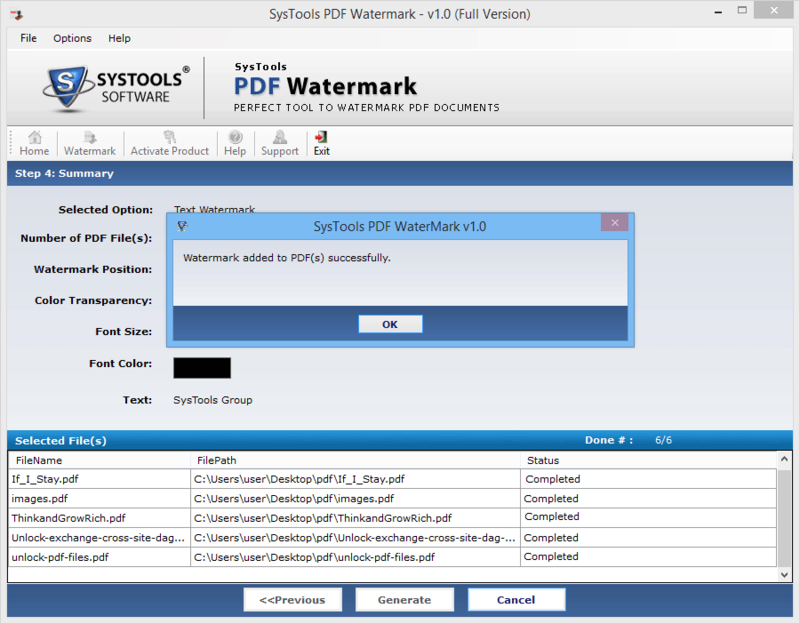 On successful completion of the process, Add PDF Watermark tool will generate a progress report specifying the details such as name of the file, stamping status and location of PDF file where it has been restored after adding watermark in a effective manner. 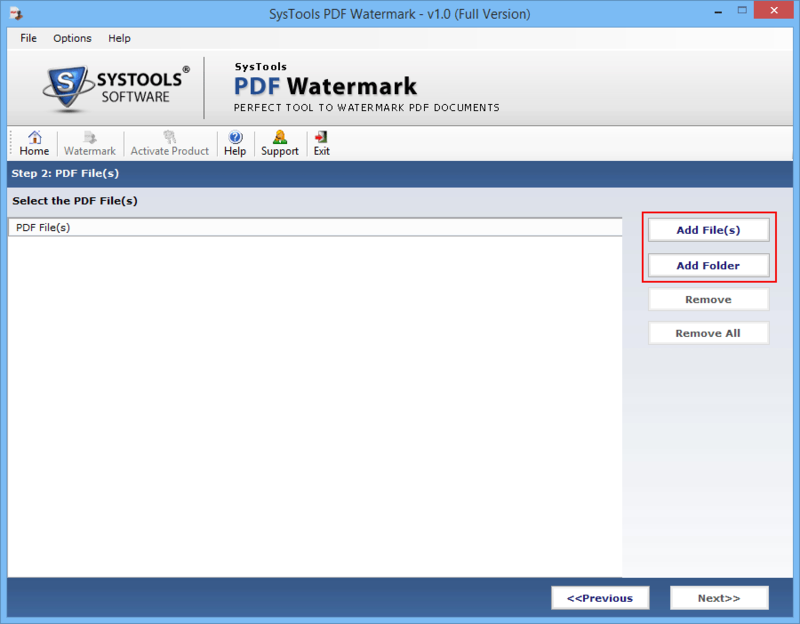 Step 1: Move to "Start" >> "All Programs" >> "PDF Watermark". To begin with the process, click on "Watermark". Step 2:Select from the two options given below. If you want to add text Watermark, click the first radio button. And then click "Next" to proceed further. Step 3: Add the PDF files to the software panel by clicking on "Add file" / "Add folder" button. Step 4:File from the panel can also be deleted by "Remove" / "Remove All" button. Step 5:Now fill in the details: First is the text field: Fill the text, which you want to apply as watermark in your PDF file. 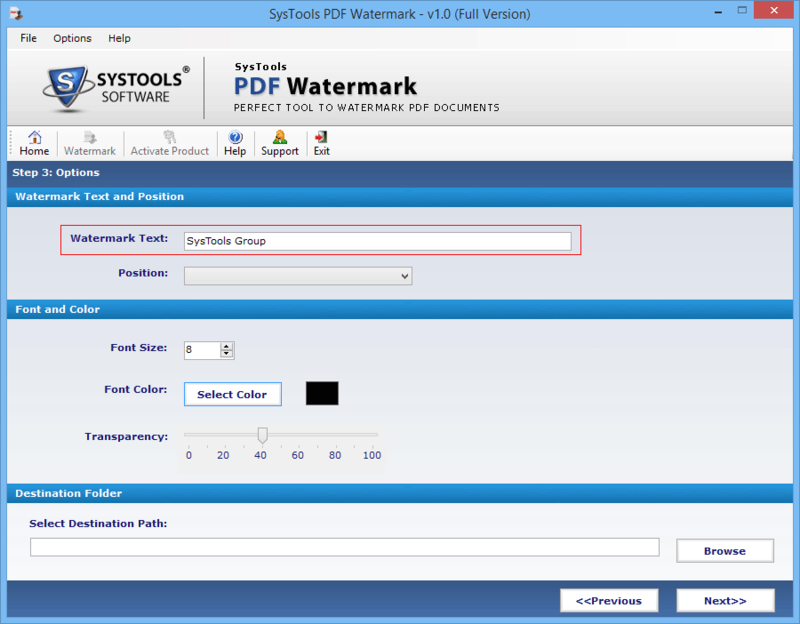 Step 6:Position: Specify the position of the text in order to set the text watermark in your PDF file at correct position. It contains options such as: Top Horizontal, Button Horizontal, Left/Right Vertical, etc. Step 7: Specify the "Font size" in the field provided. The default size for text Watermark is 8. Step 8:Select color of the Text from the color panel. By default, the color of text is black. Step 9:Select the transparency level, by dragging the slider. By default this level is set as 40 for Text Watermark. Step 10:"Browse" the destination location to store the output file. Step 11:Click on "Next" button to proceed further with the process. Step 12:A summary will be generated specifying values for each selected option. In order to carry out the process, click on "Generate" button. Step 13:On completion of the whole process successfully, tool will display a confirmation message. Step 14:View the resulting files located in the destination folder. 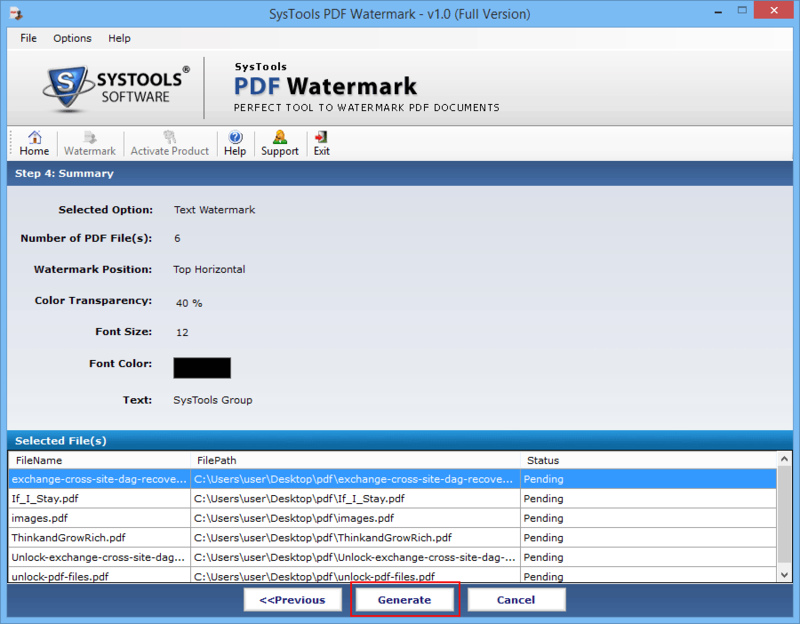 Step 15:Open the file and verify that whether watermark has been applied correctly or not. When I asked a friend for the possibility of adding watermark in my PDF documents, the suggestion was Adobe Acrobat Pro. 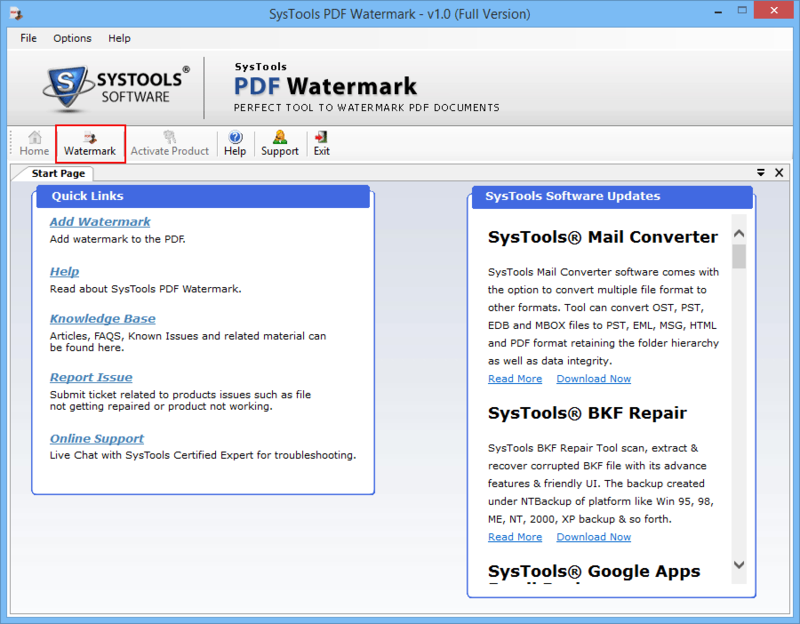 The application wasn't affordable while going through the web gave me a better solution, PDF Watermark. So glad I found it! There have been issues with the number of files that can be watermarked at once using other applications. However, what I was looking for was a tool like the PDF Watermark that could not only watermark multiple files at once but also provide customization options.